Which one is your favorite? I’m partial to the last one because of my interest in tax competition. 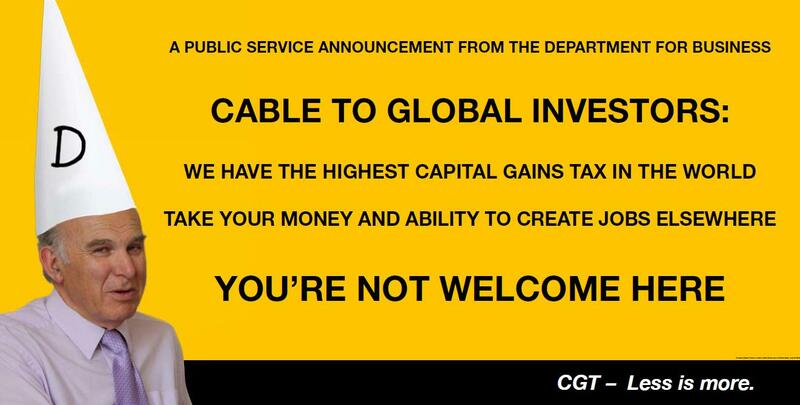 By the way, “CGT” is capital gains tax, and “Vince” and “Cable” refers to Vince Cable, one of the politicians pushing this punitive class-warfare scheme. 2) voting for policies that will hurt you today, but benefit you tomorrow. Do you – and the rest of the vote for income-redistribution crowd – see that today is a lot shorter than tomorrow – the rest of your life? Let’s look at exercise, a great analogy. When you start exercising, it hurts, big-time! That painful feeling is presumably why many people avoid it. Yet in the long-term, exercise is both good for you and brings you major health benefits. …. 3 billion people are growing at 5-10% …. Five to ten per cent, eh? For five to ten per cent of three fifths of five-eighths of sweet Eff-All; — less stupendous amounts for bribes and graft and corruption and to compensate for abjectly unreliable utilities and a non-existent infrastructure don’t amount to a sustainable hill of beans! And, in any case, as goes (well, went, actually) Europe, goes Asia. on October 17, 2010 at 5:58 pm Sean L.
I disagree. 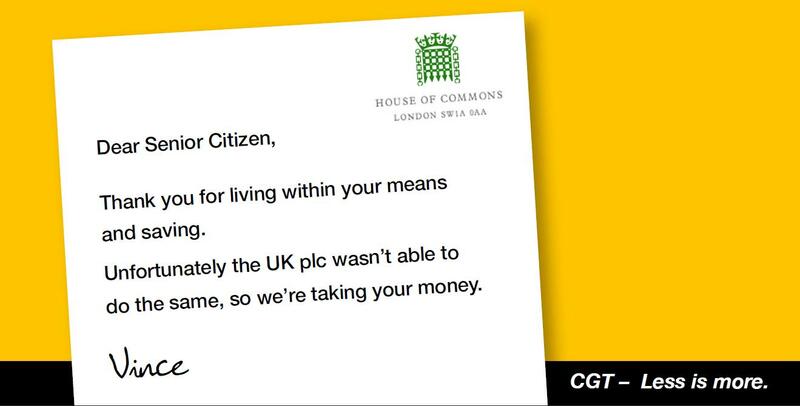 I’m not sure how it is in the UK, but here in the states, I think a very large majority still attempt the honesty of living within their means and are particularly annoyed when their own livelihood is taken and given to those that don’t. Which is why the first one hit me hardest. As a matter of fact, that’s a great Facebook status. It may even fit as a tweet. Western world ads that are trying to convince the 1 billion people of the first world countries to grow at 2.5%, instead of 1.5%. Meanhile 3 billion people are growing at 5-10%! Good luck Western World upper, middle and lower class in all! I understand what the ads say, and in part agree. However, the stark reality of today’s difficult economic climate is that my family and I are hurting economically. So even if this was a result of past mistakes that perhaps I as a voter made, today’s reality remains that the resultant low growth rates and competition from what once used to be the third world, are putting my family in economic distress. So I need help! And I need it now! I can vote for Mr. Cable who will use other people’s productivity to prop up a bit my standard of living immediately, or I can vote for a handful of supply side politicians who will let me suffer while talking about some vague eventual prosperity down the line.